Glazed Salmon Recipe - Here is another tasty and healthy recipe of Salmon with vegetables. Vegetarian recipe loving people will love to taste this. 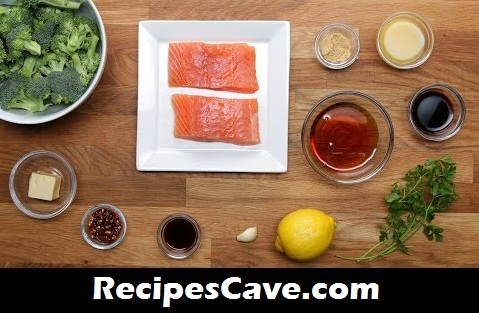 Here follow the bellow simple steps to make Glazed Salmon at your home. For the salmon, heat vegetable oil on medium-high in a cast-iron skillet. For the broccoli, fill a medium pot halfway with water. Add a dash of salt and start boiling water. In the meantime, whisk together maple syrup, orange juice, soy sauce, garlic, salt, and pepper in a medium bowl. Set aside 2 tablespoons for topping later. Place salmon fillets inside the bowl and make sure each side is covered with sauce. Sear the salmon 2-3 minutes on each side. Brush the tops with the sauce set aside. With the pot of water boiling, add the broccoli and cover lid. Blanch for 2 minutes then drain under cold water to stop the cooking. In the drained pot of broccoli, stir in butter, soy sauce, some lemon zest, and red pepper flakes on low heat. Mix until broccoli is well-coated. On each plate, serve a filet of salmon and scoop of broccoli. your Glazed Salmon Recipe is ready to taste.